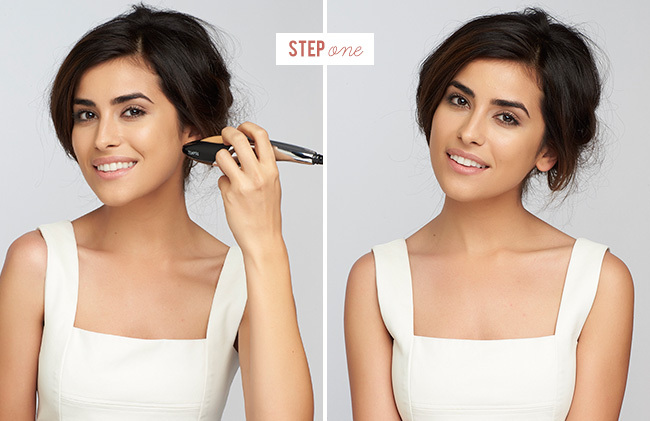 If you are thinking about doing your own makeup for your wedding events, we have a fun tutorial today using theTEMPTU Airbrush makeup system. With TEMPTU, you can achieve a natural-looking, flawless finish that only TEMPTU airbrush makeup can deliver with their patented technology and pro-based formula. And a big thanks to Sazan for modeling the kit and sharing how she would use the system for a summer wedding. With a clean face, I applied TEMPTU’s Natural 007 AIRpod foundation all over my face. It can be a little nerve-wrecking the first time you try it so here are some helpful application tips below to keep in mind. • SOFT TOUCH: Light and steady pressure on the trigger. • KEEP MOVING: Move hand slowly in small even circles. • BACK OFF: Stay 4 – 6 inches away for a feather-light finish. I am a victim to dark circles so I can’t skip concealer. Like ever. I applied TEMPTU’s Undereye Concealer in Medium 108 mixed with their amazing Concealer Wheel. You might not need the stick because the concealer wheel works so perfectly. If you do get the stick, I recommend going half a shade or one shade lighter since dark circles tend be darker than our overall skin tone. My favorite part! I love a rosy cheek and matching lip. I applied TEMPTU’s AIRpod blush in Jade Rose to my cheeks and a little on my lips. Yes.. I said lips! Their blushes are uniquely designed to work as a lip stain as well. I thought that was pretty cool when I found out! To finish off my look I used TEMPTU’s AIRpod highlighter in Gold to add a little extra glow to my collar bone, cheek bones, and shoulder blades. 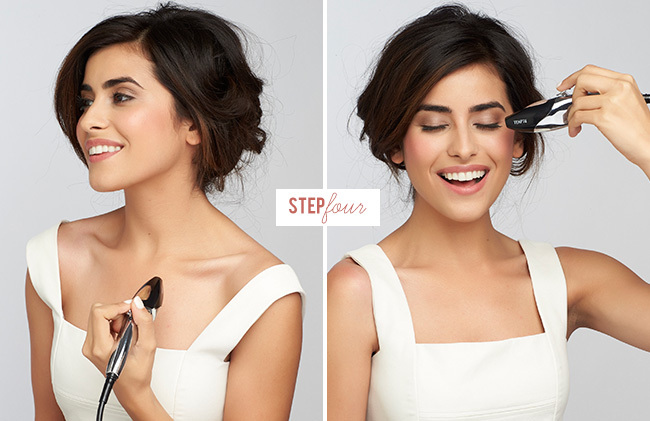 This especially looks great if you’re wearing a strapless gown/dress. The spray is so light you can even target a subtle amount to your eye’s tear ducts and cupid’s bow for an extra soft glow! Remember, a highlighter’s purpose is to highlight so keep it subtle! So fun! If you have a wedding coming up TEMPTU’s Bridal Kit (below) is a great idea. It can be used for just about anyone in the wedding party whether it’s for the bride-to-be, bridesmaid, entire bridal party, mother of the bride OR if you’re a guest of a wedding(s)! It’s a universal kit and you get the option to customize your shades. The kit includes 3 Foundations, 2 Blushes, a Highlighter, Primer, Bronzer and 2 concealers.